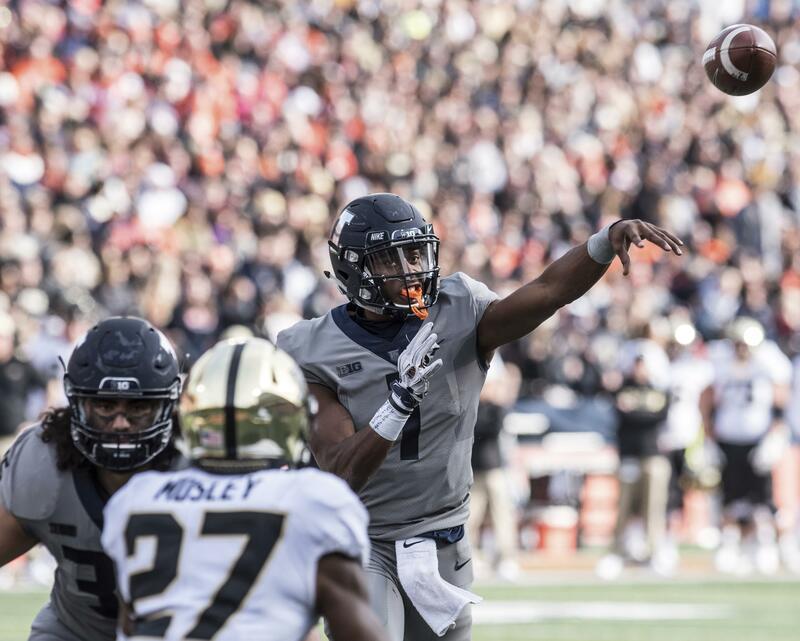 llinois quarterback AJ Bush, Jr (1) throws in the first half of Saturday's homecoming game between the Illini and visiting Purdue at Memorial Stadium. .
Purdue rolled over Illinois 46-7 on Saturday, dampening the Illini homecoming festivities and dimming their postseason hopes. Purdue racked up 611 yards in total offense compared to Illinois' 250. 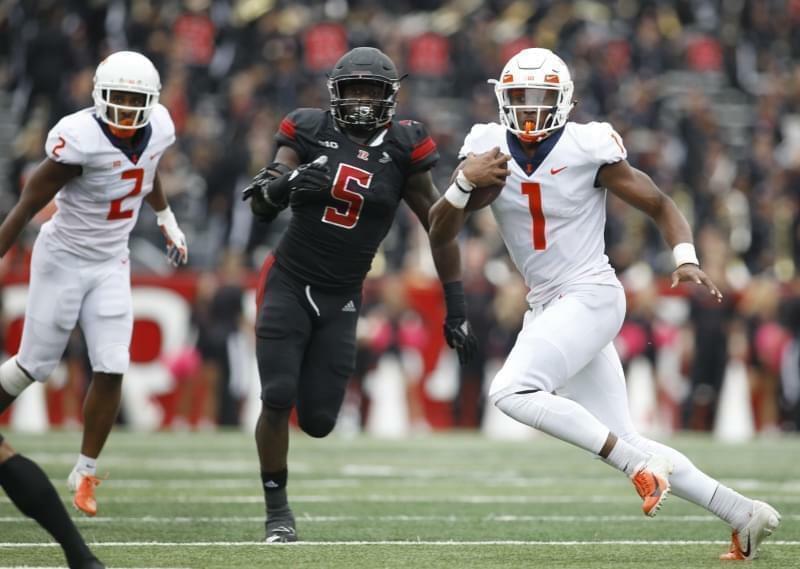 The Illini, which led the Big Ten in takeaways and ranked sixth in the nation in turnovers gained per game, forced its only turnover late in the third quarter when Cameron Watkins tipped a David Blough pass and it was intercepted by Sydney Brown. Illinois was unable to capitalize on the interception. Purdue sacked Bush four times and pressured him all game. "The great thing is as coaches we've gotten better at attacking and being aggressive and taking some chances." Purdue coach Jeff Brohm said. "It helped us get a lead and take Illinois out of its game." D. J. Knox gained 150 yards rushing on 17 carries for the Boilermakers. Markell Jones had seven carries for 56 yards and a touchdown. Alexander Horvath also scored a touchdown. Purdue amassed 227 yards rushing, compared to 69 for Illinois. Isaac Zico and Rondale Moore combined to catch nine passes for 228 yards for the Boilermakers. Bush finished 12 of 25 for 170 yards passing and one interception. Bush also was the Illini's leading rusher, gaining 24 yards on 20 carries. Illinois kicker Chase McLaughlin, who leads the nation in field goals of 50-plus yards going into the game, missed a 38-yard attempt midway through the second quarter that would have drawn Illinois to within four points. "You have to give Purdue credit," said Illinois coach Lovie Smith. "We would have liked to run the ball and we couldn't. We couldn't establish drives and it hurts the running game when you only have the ball for short periods of time." Blough finished the day 25-of-36 passing for 377 yards and three touchdowns. He also caught a seven-yard touchdown pass on a reverse from wide receiver (and former quarterback) Jared Sparks. It was Sparks' first career touchdown pass. 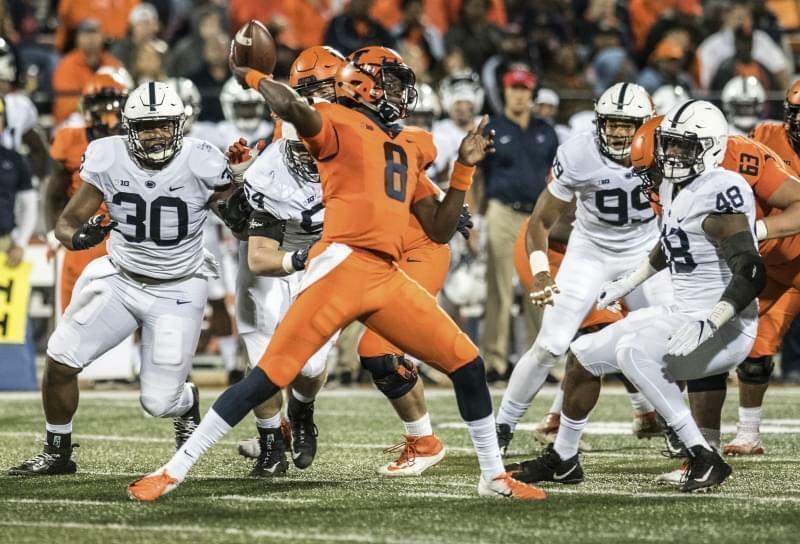 The previously effective Illinois running game all but disappeared on Saturday. Running back Mike Epstein, an effective offensive weapon throughout the season, didn't touch the ball until late in the first half when he caught a four-yard Bush pass. Epstein ended the day with one carry for 10 yards. "We just couldn't get (Epstein) involved," Smith said. "We have to establish drives and pass the ball to get to our running game. Our offensive line didn't play well either. We were just outplayed and dominated on both sides of the ball today." Purdue's 39-point win was the largest margin of victory since 2012 when it beat Eastern Kentucky 48-6. Against an FBS opponent, Saturday's point margin was the largest since Purdue defeated Indiana 62-10 on Nov. 22, 2008. Purdue beat Arizona 38-35 in last season's Foster Farm Bowl and can still make it to a second consecutive bowl, but needs to beat Indiana and Minnesota plus notch a home win over Iowa to have a realistic chance of getting there.